Artemia salina and Artemia Franciscana are small, aquatic creatures that can be found thriving in the Dead Sea (1). Over time, Artemia salina and Artemia Franciscana have been found in areas with a relatively higher level of salinity, which is a measure of grams of salt (NaCl) per milliliters of water (H2O). This preference of habitat is most likely due to natural selection; some Artemia salina and Artemia Franciscana were better equipped to live in areas that had levels of salinity too high for predators to coexist (2). That being said, there is still a lot that is left to be discovered about the relationship between salt and the hatching viability of Artemia salina and Artemia Franciscana: 1) Can the amount of salt hinder or enhance the number of hatched shrimp? 2) Can the amount of salt increase or decrease the speed of the hatching process of Artemia salina and Artemia Franciscana? 3) Is the amount of salt significant at all in regards to the hatching viability of Artemia salina and Artemia Franciscana? In order to begin answering some of these larger questions, a simpler question must be addressed: what is the effect of varying levels of salinity on the hatching viability of Artemia salina and Artemia Franciscana? The experiment hinged upon five chambers, each with different levels of salinity (0.5%, 1%, 2%, 3%, 4%). Twenty Artemia salina and Artemia Franciscana were placed in each chamber and recorded the results over two days of observation. The hypothesis is that the hatching viability of Artemia salina and Artemia Franciscana increases as the salinity level of their environment increased. The experiment yielded results in sync with the hypothesis: in chambers with higher salinity levels, a significantly greater amount of Artemia salina and Artemia Franciscana hatched. Artemia salina and Artemia Franciscana have been known to dwell in areas with high level of salinity (1, 2). However, the effects of salinity of on the hatching viability of Artemia salina and Artemia Franciscana is still widely unknown. Several experiments suggest that salt may play a role in the hatching viability of Artemia salina and Artemia Franciscana, including Covi’s study on Rotenone and the hatching success of zooplankton, Vo’s study on skeletal muscle growth dynamics, and Manfra’s study on the lethal and sublethal observed in Artemia salina and Artemia Franciscana to various toxicants and organic compounds. The research of Covi et al focuses on how some species of zooplankton are unable to repopulate after they are exposed to harmful chemicals due to the treatment of water resources with rotenone, a piscicide (3). They noted that this could be because some species of zooplankton lack the capacity to switch to anaerobic pathways in the presence of rotenone, which blocks mitochondrial electron transport (3). They found that rotenone severely affects and inhibits the growth and development of zooplankton embryos, which means that aquatic environments near chemical dumping sites could be seriously at-risk (3). Artemia salina and Artemia Franciscana, which are very similar to zooplankton in physical structure and genetic makeup, could also be affected by certain chemical compounds. The research of Vo et al focuses on how the dietary habits, in particular when they are initially allowed to eat, of cod larvae can affect their muscle growth and development leading into their adult stages (4). They presented data that showed that the nutritional quality of the food that cod larvae consume during the early stages of their lives does not significantly affect their growth (4). Perhaps, chemical components and organic compounds, like zooplankton, are more responsible for the development of cod larvae and Artemia salina and Artemia Franciscana. Manfra et al researched the effect of toxicants and organic compounds on the swimming speed alteration, mortality values and hatching rate inhibition of Artemia salina and Artemia Franciscana (5). They evaluated the sensitivity of these categories in relation to one another, to view which is affected more by toxicants and organic compounds (5). They evaluated that the two categories most affected were the swimming speed alteration and the hatching rate inhibition of Artemia salina and Artemia Franciscana, suggesting that certain chemical compounds can have a significant impact on the birth, growth and development of Artemia salina and Artemia Franciscana, as well as other aquatic organisms (5). the hatching viability of Artemia salina and Artemia Franciscana is severely inhibited by particular chemical compounds. However, the one compound that has not been tested is the one that is most prevalent in environments of Artemia salina and Artemia Franciscana: salt. Perhaps salt has a huge negative impact on the hatching viability of Artemia salina and Artemia Franciscana and can give us insights on the effects of salt on other prominent aquatic organisms. Perhaps knowledge can be gained on how salt and environments with high levels of saline can affect human birth, growth and development. In order to observe how varying levels of salinity affects the hatching viability of Artemia salina and Artemia Franciscana, five chambers were established with different amounts of salt and recorded the outcomes over two days. The control level of salinity was 2%. The other four values differed significantly from this value in order to add variance to the data sets, and give us results that would adequately test the hypothesis. The first chamber had a salinity level of 0.5%. To create this level of salinity in the chamber, 0.2 grams of salt were applied to thirty milliliters of distilled water. The second chamber had a salinity level of 1%. To create this level of salinity in the chamber, 0.3 grams of salt were applied to thirty milliliters of distilled water. The fourth chamber had a salinity level of 3%. To create this level of salinity in the chamber, 0.9 grams of salt were applied to thirty milliliters of distilled water. The fifth chamber had a salinity level of 4%. To create this level of salinity in the chamber, 1.2 grams of salt were applied to thirty milliliters of distilled water. Using a paintbrush, twenty Artemia salina and Artemia Franciscana eggs were dabbed onto a piece of double-sided tape. Then, the tape was attached to slides and submerged the slide in the solution in the chamber. After, each chamber was sealed until the designated time for recording the results. On Day 1, one Artemia salina and Artemia Franciscana egg hatched in the first chamber, two in the second chamber, one in the third, three in the fourth and six in the fifth. One Day 2, sixteen Artemia salina and Artemia Franciscana eggs hatched in the first chamber, twenty in the second chamber, thirty in the third, thirty-four in the fourth, and thirty-one in the fifth. This bar graph shows a comparative representation of the data. On Day 1, one Artemia salina and Artemia Franciscana egg hatched in the first chamber, two in the second chamber, one in the third, three in the fourth and six in the fifth. One Day 2, sixteen Artemia salina and Artemia Franciscana eggs hatched in the first chamber, twenty in the second chamber, thirty in the third, thirty-four in the fourth, and thirty-one in the fifth. In all five chambers, more Artemia salina and Artemia Franciscana eggs hatched on the second day than on the first. We initially hypothesized that as the level of salinity increases, the hatching viability of Artemia salina and Artemia Franciscana will also increase. In the control, chamber three, one Artemia salina and Artemia Franciscana hatched on day one (Figure 2). On day two, there were thirty hatched eggs (Figure 2). These were in fact significant changes (76.55 and 21.65 respectively), so the varying levels of salinity had a significant effect on the amount of Artemia salina and Artemia Franciscana that hatched. Artemia salina and Artemia Franciscana in this chamber also showed signs of activity, which could have been due to the level of salinity as well. Because this is the control, significant drops in hatched eggs would suggest that a lack of salinity affected the Artemia salina and Artemia Franciscana hatching viability negatively. The opposite is true as well: if the significant increases in hatched eggs would suggest that a level of salinity greater than two percent would suggest that the presence of salt in the solution positively affected the hatching viability of the Artemia salina and Artemia Franciscana. In chamber one, one Artemia salina and Artemia Franciscana egg had hatched on day one (Figure 2). One day two, however, this number had ballooned up to sixteen (Figure 2). This is the smallest jump amongst all the other chamber values. However, the day one value is the same as the control. Perhaps the level of salinity does not alter the hatching viability of Artemia salina and Artemia Franciscana eggs in the first twenty-four hours, at least in the first chamber because the first day of observations showed the same number of hatched eggs, but the second day showed vast differences. In the same way, it seems the level of salinity affects the jump between in hatched Artemia salina and Artemia Franciscana eggs between days one and two, or a forty-eight hour timespan, as opposed to a twenty-four span. In chamber two, two hatched Artemia salina and Artemia Franciscana eggs were found on day one, but on day two, twenty hatched Artemia salina and Artemia Franciscana eggs were recorded (Figure 2). 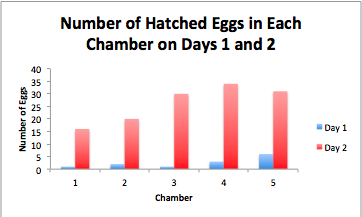 The jump from one to two on day one is significant; the level of salinity in the second chamber did lead to the increase in the number of eggs hatched on day one (76.55). Likewise, the increase in the number of eggs hatched on day two is significant also (21.65). So, the level of salinity is playing a role in the amount of the eggs that were hatched. But it seems that the level of salinity may actually have a role in the muscle growth and development of the Artemia salina and Artemia Franciscana . In chamber two, groups of Artemia salina and Artemia Franciscana hatched together on day one, but still stayed around the tape. On day two, the Artemia salina and Artemia Franciscana huddled on a group of tape on a group of tape, again with little movement. On day one, the same trends were seen: on day one, when the eggs hatched, the Artemia salina and Artemia Franciscana stayed near the tape, and on day two, the eggs floated lazily near the bottom of the chamber. This suggests that the level of salinity plays a role in the muscle growth and development of Artemia salina and Artemia Franciscana ; the lack of salt decreases the capacity of muscle growth and development. In chamber four, there three hatched Artemia salina and Artemia Franciscana eggs on day one (Figure 2). On day two, there were thirty-four (Figure 2). Again the changes on day one (76.55) and day two (21.65) are significant. So, the level of salinity played a significant role in the amount of eggs hatched from during the days of observation. Furthermore, chamber four provides further evidence that salinity plays a role in the muscle growth and development of Artemia salina and Artemia Franciscana . On day one, the shrimp hovered by the light, and on day two, the shrimp were observed moving around the rim of the chamber. In chamber five, six hatched Artemia salina and Artemia Franciscana eggs were recorded (Figure 2). On day two, thirty-one hatched eggs were found (Figure 2). Like the other four chambers, the level of salinity made a significant impact on the eggs that were hatched. The Artemia salina and Artemia Franciscana behavior in this chamber is the most compelling support for the role of salt in improving the muscle growth and development of Artemia salina and Artemia Franciscana . On day one, the Artemia salina and Artemia Franciscana were noticeably active relative to the other chambers, and on day two, the Artemia salina and Artemia Franciscana were bigger, relative to the other chambers, and their level of activity persisted. Other students also conducted similar experiments and came up with interesting results. Cal Seitz, Kali Blain and Justin Hurley investigated which level of salinity resulted in the most number of Artemia salina and Artemia Franciscana eggs hatching. They tested five different saline solutions (0-4%) in five different chambers and found that most of the eggs hatched in the chamber with two percent salinity. This could be because they counted the sheer number of Artemia salina and Artemia Franciscana eggs as opposed to calculating the percentage. It is difficult to get the same number of eggs in each chamber, and it is even more difficult to accurately count them all once they hatch. Therefore, although it is interesting that they found that the greatest amount of eggs hatched in the control, these results could be subject to error. Asher Mitchell, Noah Salmon and Lucas Kimball also conducted a similar experiment; they investigated how the salt concentration of the environment of the Artemia salina and Artemia Franciscana affected the hatching viability of Artemia salina and Artemia Franciscana. Like the experiment of Seitz et al, Mitchell et al used five chambers and measured the results over two days. However, they measured the percentage of shrimp that were hatched (hatched over non-hatched eggs), and like us, they found that the greater amount of hatched Artemia salina and Artemia Franciscana eggs were in the chambers with the greatest concentration of salinity. There were a few components of the experimental setup that limited the experiment from replicating a precise Artemia salina and Artemia Franciscana environment, thus limiting the precision of the results. For one, the Artemia salina and Artemia Franciscana environment, the chamber, was too small. For organisms that inhabit aquatic areas like the Dead Sea, a larger chamber or apparatus would have been more appropriate. Other limitations involved the depth of the data acquisition tools that were available to us. The microscopes provided a small window to see the number of eggs hatched accurately. The stage clips were difficult to adjust properly, which again interfered with the ability to accurately count the number Artemia salina and Artemia Franciscana eggs that were hatched. Furthermore, the measuring scale that was used to measure the grams of salt to apply to the appropriate chamber did not measure to the hundredths place. Therefore, the amount of salt in chamber two was not as accurate as it should have been. That being said, the tools were not the cause for all the blame. As with any experiment, human error definitely played a part. A lot of solution was spilled from the third chamber due to shaky hands. The paintbrush was difficult to use as and placing the shrimp onto each slide was difficult. Also, each slide was not put in the their appropriate chamber at the same time, which may have skewed the results. Furthermore, other variables could have interfered with the results. The light and temperature of the room could have played a part in the hatching viability of Artemia salina and Artemia Franciscana as well the effects of varying levels of salinity. Our experiment as a whole could benefit from several improvements. First and foremost, it could benefit from more trials. Because only one set of Artemia salina and Artemia Franciscana eggs was tested, the sample size is too small to make any proper generalizations about the entire species, let alone other aquatic organisms and humans, which the experiment has the potential to do. Secondly, a greater variance in salinity would be a great improvement. Artemia salina and Artemia Franciscana have known to live in areas where the salinity level was around twenty-five percent, so it would have been interesting to see the eggs are affected across a wider range. Therefore, it is impossible to make generalizations about all of the Artemia salina and Artemia Franciscana living in all types of environments. A final improvement would be getting larger chambers. Larger chambers for the Artemia salina and Artemia Franciscana eggs to hatch in would replicate a more realistic environment for the Artemia salina and Artemia Franciscana, yielding more realistic and more accurate results. However, the results still allow us to come to some compelling conclusions. The level of salinity plays a significant role in the hatching of Artemia salina and Artemia Franciscana and is pivotal to their growth and development as well. However, more trials across a wider range of salinity level would have been even more helpful to see justify the trends, and perhaps even find new trends. In regards to the greater scope of organisms that may be affected by varying levels of salinity in general, like humans and other organisms that may live in or around or depend heavily on aquatic resources or environments, the sample size was too small to make any confident extrapolations. That being said, the data hints at the fact that, perhaps, the relationship between hatching viability and muscle development and varying levels of salinity should be looked at by scientists interested in the development of aquatic organisms. Big thanks to all those who assisted in the experimental design, experimental setup, data acquisition and data organization and presentation: Sasha Miasnikova, Saira Chowdhry and the C Band AT Biology class. Development: Implications for Zooplankton Egg Banks. Plos One (September 2016). larvae (Gadus morhua L.). Biology Open (September 2016). Mitchell et al. The Effect of Salinity on Brine Shrimp Hatching. Unp (October 2016).